It’s no secret that I just love Angel Lawson’s writing. I fawned over reviewed her first book, Wraith, and have mentioned her no less than nine times in various posts on my blog. Her second book is a different kind of story that the first; it’s lighter and funnier than Wraith, but the writing is sharp and clever and you will learn more than you ever wanted to know about the convergence of sudden fame and the internet. Summer’s all planned out. Updating your fansite with your best friend; sitting by the pool, staring (but never having the guts to talk to) that hunky lifeguard; babysitting for some serious cash; getting ready for college. Then, only weeks before graduation, a video about your fav zombie comic shot by your best friend that you (reluctantly) starred in gets some serious play on YouTube. Before you know it, your Z.net website is getting tons of hits, you meet the creator of Zocopalypse, the comic that you and your best friend obsess about, AND the creator, Gabe Foster, tells you he has SEEN your video. On top of that, you and your bestie get to lead off the annual Zombie Parade at FantasyCon and get invited to be press at the Zocopalypse panel. Life. Lived. Fully. Oh but the chocolatey goodness doesn’t stop there. Additional bizarreness happens when Gabe asks you to audition for the lead in the Zocopalypse miniseries that will be shown on television. Not only that, but the male lead has already signed on, and it’s none other than Andrew Xavier, the seriously hot former child star who is all grown up. And hot. (Did I already say that?) How can you say no, even though you think you will be the ruination of the project? In line with every fan’s fantasy, Ruby Miller does get chosen to play Alexandra, the tough yet vulnerable lead who kills zombies alongside the splendiferous yet secretive Wyatt (played by Andrew Xavier, Mr. SupahHot). Then Ruby gets a faceful of all Hollywood has to offer: insta-fame, the paparazzi, speculation, love, hate, jealousy. Then there’s the fun part (EMOTICON SARCASM): anonymous internet trolls mock her acting, looks, ability to play Alexandra, and her love life. The last straw is when it’s discovered that there’s a weasel on the set who is selling insider information and photos to a hater website, including some information that could be the downfall of the series, not to mention some personal lives. This is a fun read that allows every fan to live out the “what if.” It’s a solid three that becomes a four because of authentic writing and the amusing extras: the use of footnotes, the addition of text from the script for the miniseries and all sorts of crazy fandom info. The writing’s spot-on and funny without being too insider or unreal. The artwork used at the beginning of each chapter adds a little something as well (and I love the skull/star used to separate scenes). To be honest, you may see the ending coming, but you are going to have a good time getting there. 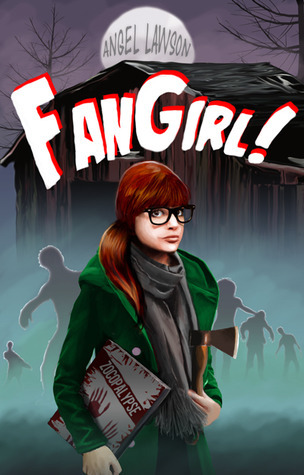 FanGirl by Angel Lawson was published July 20, 2012 by CreateSpace. A free copy of this book was given to Ink and Page in return for an honest review. Such a well-thought out and objective review. I’ve read all of Angel Lawson’s books except this one, and this review has given me the impetus to read this offering, as well. Thanks for giving highly coveted publicity in the form of reviews to an extremely talented writer! Thank you, Bev! If you liked her other offerings, you will enjoy this (particularly if you read her blog as well). I am getting ready to devour Serial Summer in a couple of days. I may just christen this month Lawsonvember and be done with it, ’cause next will be the INTERVIEW!